The Washington Wizards halted their two-game skid on Friday in Detroit, overcoming a sluggish start with a second-half offensive explosion against the Pistons. Bradley Beal and Kelly Oubre Jr. led all scorers with 26 points each, which was a career-high effort from Oubre. For The Panda, the performance was his 35th game in which he eclipsed the 20-point mark, most among Eastern Conference guards this season. Beal turned in yet another highly efficient shooting performance Friday, going 7-12 from the floor, 4-7 from downtown and 8-9 from the charity stripe. After another slow start, the Wizards looked as if they were on their way to dropping a third straight game against an Eastern Conference foe. Washington trailed 29-19 after the first quarter, but turned it around to draw even at halftime, with the score deadlocked at 46. Beal and his teammates weren’t too worried, though, because they felt they were doing the right things offensively. They just couldn’t get open shots to fall as often as they’d like in the first half, but they knew they would start making them eventually. Coming out of the break, the Wizards wasted no time building their lead. The Wizards erupted for 45 points in the third period, taking a 91-74 lead into the final frame. Beal scored 13 of his 26 points in the third quarter to lead the Washington offense to their highest-scoring half all season. Washington was lights out in the third period, shooting 80 percent (16-20) from the floor and 75 percent (6-8) from three in the quarter. 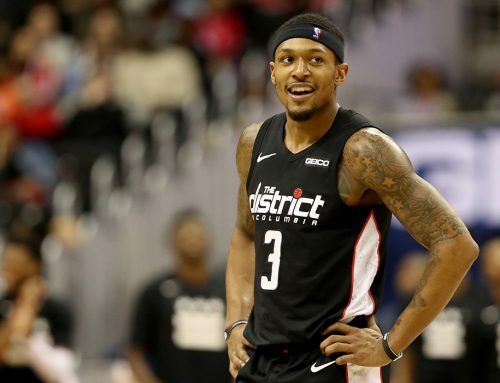 “The third quarter was really big for us,” said Beal. The Wizards held on in the fourth for a 122-112 victory and righted the ship in Washington after a pair of tough losses. “We did a good job of staying poised and executing on offense and getting stops when we needed to,” said Beal after the game. The Wizards will look to build on this performance in Dallas against the Mavericks on Monday at 8:30pm ET.